Nordens Ark in western Sweden is dedicated to protecting and preserving endangered species. Two of my grandchildren had a happy time this summer at a Swedish park that is dedicated to protecting and preserving endangered species. The children’s Swedish grandmother told me that the pony rides and other attractions draw families in to Nordens Ark and then get them interested in supporting the sustainability mission. From the paark’s website: “Nordens Ark is a private non-profit foundation that works to ensure endangered animals have a future. We are engaged in conservation, rearing, research and training, as well as doing what we can to increase public awareness of biological diversity. Much of our work is done in the field, both in Sweden and overseas. “We strive to strengthen populations of at-risk species by releasing individuals into the wild, and by improving the habitats in which they live. In Sweden, Nordens Ark has national responsibility for breeding and releasing, among others, the peregrine falcon, white-backed woodpecker, lesser white-fronted goose, green toad and several beetle species. More at the website, here. Sweden Tips lists the park in its survey of Sweden’s best zoos. If you want to visit Nordens Park, you can also find lots of enthusiastic comments at Trip Advisor, including “a fantastic place for a photographer” and a recommendation to come at feeding time. Someone I know, 3-1/2, took a pony ride at Nordens Ark in Bohuslän, Sweden, this summer. The park encompasses more than [900 acres] and includes pastureland, woodland and animal facilities. Not long ago, Julia Griffin of PBS NewsHour interviewed an artist who has turned plastic trash into sculptures with a message. “Angela Haseltine Pozzi is the lead artist and executive director of Washed Ashore, a nonprofit seeking to educate the public on the plastics polluting the word’s oceans. “ANGELA HASELTINE POZZI: We create sculptures that can teach people about the problem. And, as an artist, it is a real challenge to use everything that comes up off the beach. “JULIA GRIFFIN: In six years, Haseltine Pozzi and her team of volunteers have created 66 sculptures from more than 38,000 pounds of debris collected from a stretch of Oregon’s coastline. “The countless bottle caps, flip-flops and beach toys are just a fraction of the more than 315 billion pounds of plastic estimated to be in the world’s oceans. The exhibit can be seen at the zoo until September 16, 2016. More at PBS here. Check out the Smithsonian’s site, too. In this story from radio show Studio 360, we learn that music is intriguing to animals, at the very least arousing their curiosity and perhaps stimulating and soothing them. “Laurel Braitman is a historian of science and the author of ‘Animal Madness: How Anxious Dogs, Compulsive Parrots, and Elephants in Recovery Help Us Understand Ourselves.’ She’s particularly interested in the mental health of animals in captivity. “ ‘If their minds aren’t stimulated, they can end up with all sorts of disturbing behaviors,’ she says. Braitman wondered if music — so often soothing to people, but usually foisted on animals without their permission — could help counter their symptoms of anxiety and depression. “Can we say that they liked it? “Researchers are trying to answer this question in controlled experiments where they observe whether animals move toward or away from speakers, depending on the music. The first time I really got into the Internet and computers was in 1994 when I was working at HBR. We all loved experimenting with kooky screen savers. Do you remember flying toasters? Seeing what your flying camera picked up must feel similar to riding on a train through people’s backyards, where you get a sense of lives as they are lived that you never get from a front lawn. Be sure to check out the Rob Moses Photography blog, here. On the whole, I believe in having zoos, but I do realize most of the animals would rather not be there. So I was interested in a zoo concept that was tweeted this week by @SmallerCitiesU. It’s an article about a plan for a zoo in Denmark. “Their recently revealed plans for what has been dubbed ‘Zootopia’ attempt to mesh nature with inventive design in a 1,200,000 square meter park imagined under advisement from the zoo staff. Manmade buildings would hide within the constructed natural environments and animal habitats would mimic ones found in the wild as much as possible. “The project is currently in progress, with the first phase set for completion in 2019.” More here. Today I went to the zoo. I was busy following my three grandchildren around and didn’t take many pictures. If you want to see great photographs of all the animals, go the website of the Franklin Park Zoo. There were a lot of people at the zoo today, my fist visit. So many little kids everywhere! 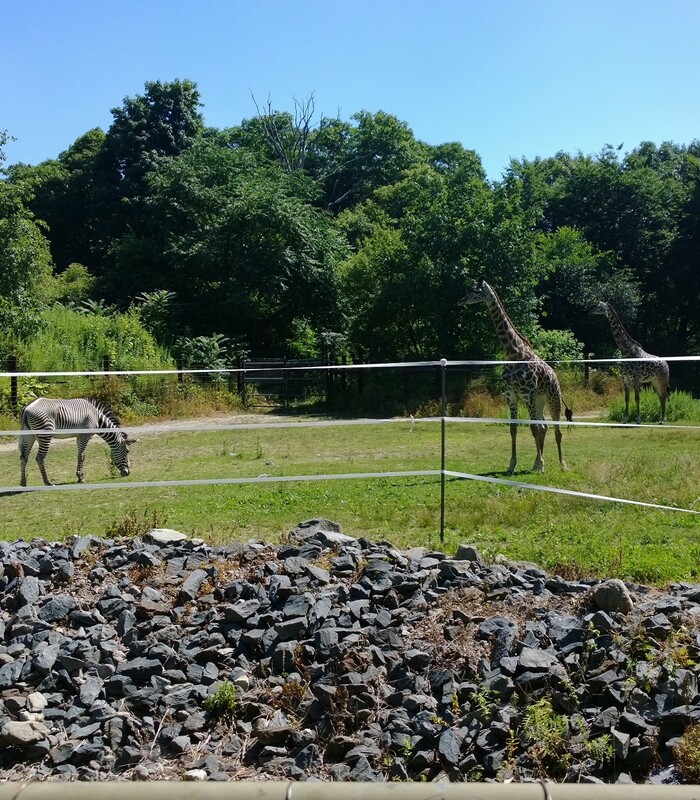 We weren’t there at the right time to help feed the giraffes, but I enjoyed seeing them. 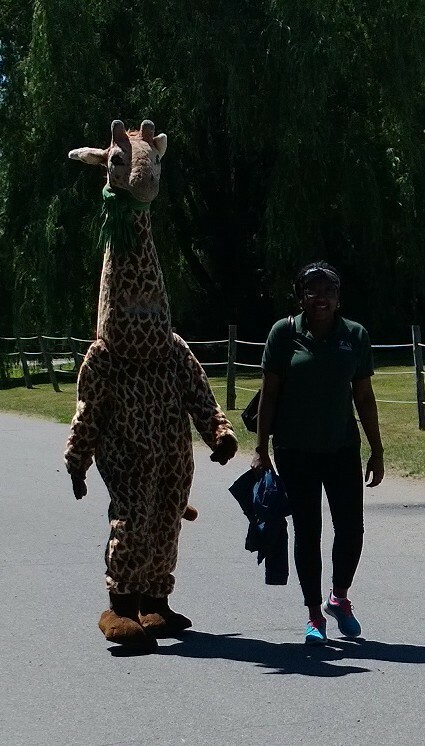 Here are couple giraffes with a zebra in the shared space — and a photo of a zoo employee dressed up as a giraffe. 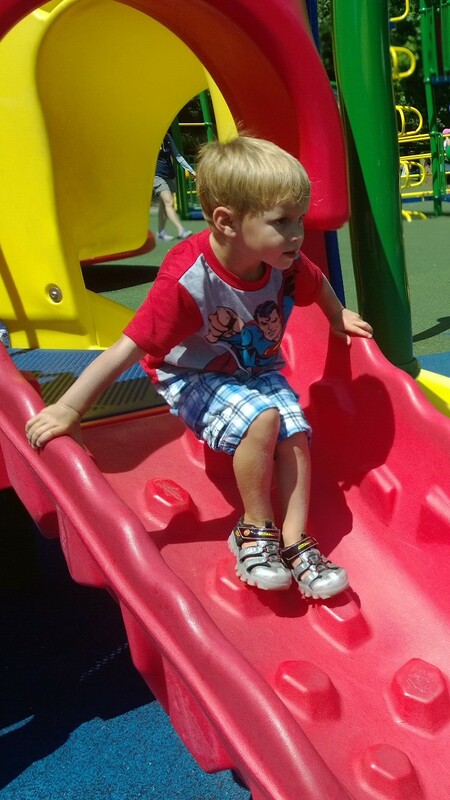 I also got a shot of my older grandson on the slide. There’s a big playground at the zoo. Suzanne thought one of the primates looked a little morose, but the lemurs were very chipper — and the birds. Hard to tell if the snakes were chipper. The big cats were sleeping. After the zoo, the kids, their parents, my husband, and I went to Sophia’s Grotto in Roslindale for lunch, where we sat outside under a tree. The two-year-old grandson took a nap in his carriage. Photo: Ashley Foughty, via Associated Press. Foughty spotted the renegade Rusty in Washington’s Adams Morgan neighborhood, and twitter did the rest. Ashley Foughty uses social media. And a good thing, too. 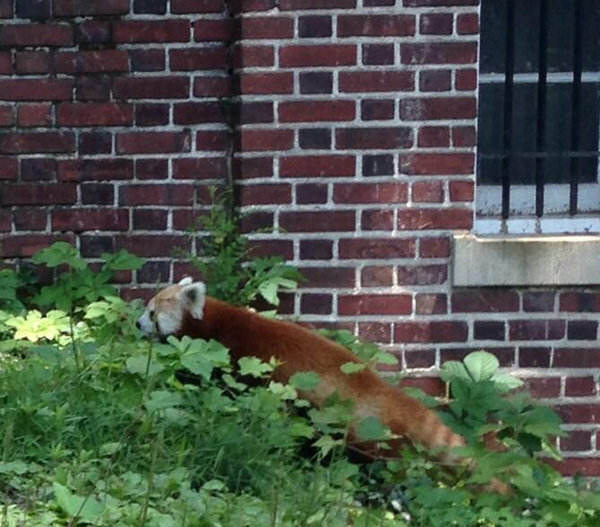 If she hadn’t responded to the zoo’s call for help finding an escaped red panda, who knows what might have happened. Trip Gabriel writes at the NY Times, “Rusty the red panda, who disappeared from the National Zoo, hijacked the news cycle on Monday. “To help find Rusty, a raccoon-size mammal with a striped tail and moon-shaped face, the zoo turned to social media, and suddenly half of official Washington broke from Serious Events to tune in to the saga of the runaway panda. “At midday, mentions of ‘Rusty’ on Twitter nearly equaled those of ‘Obama.’ …. Read what happened next. Note to all escaped zoo animals: Twitter will find you.